On the evening of Thursday December 12th 1940 my Auntie Edna, then a teenager, put on her dancing shoes and caught a tram into Sheffield city-centre to go dancing. No sooner had she got there than the sirens sounded and she spent twelve terrifying hours in a shelter as the shops and public buildings above were bombed and burnt down. He had, of course, spent the night watching the red sky over the city-centre knowing his daughter was out there in great danger. The city of Bristol suffered a succession of air-raids, one of which, on Good Friday 1941, permanently put the tram system out of use by severing the main power cable at Counterslip Bridge. The story goes that the last car to Kingswood was pushed by its passengers until it could freewheel to the depot. 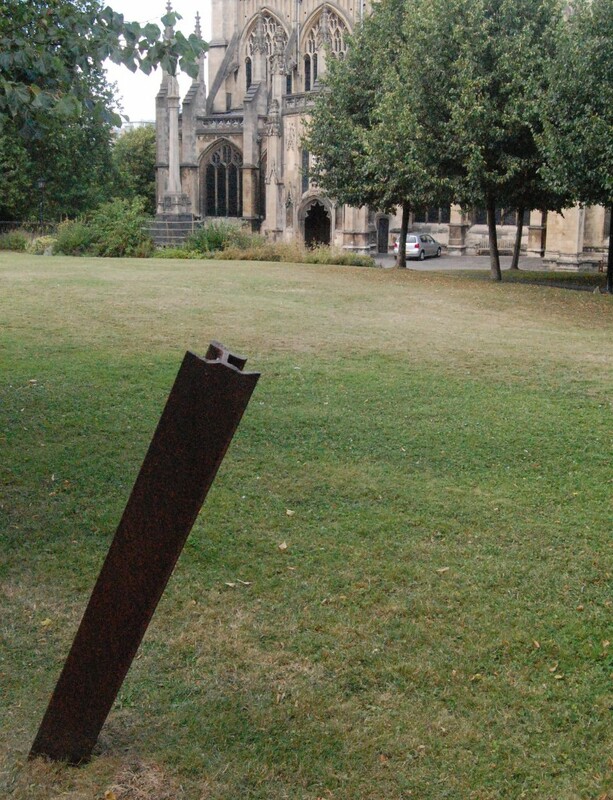 I thought of Granddad panicking about his daughter’s safety when I found a fearsome memento of the Bristol Blitz, and of Bristol’s tramway, in the churchyard of the grand parish church of St Mary Redcliffe, round the corner from Temple Meads Station. A sizeable length of tramrail remains embedded among the graves where it landed as it flew over the houses from an adjacent road. You wouldn’t have wanted to be about when debris as heavy as several yards of tramrail was flying around. No wonder Granddad was so upset, and so relieved to see his daughter bedraggled but in one piece after the Luftwaffe bombed Sheffield. This entry was posted in Transports of Delight on March 26, 2016 by Mike Higginbottom. When I first knew Liverpool in the late 1960s, St Luke’s Church was a blackened, bombed-out ruin with trees growing inside the roofless nave and the clock dials stopped at 3.36am, showing the time on the morning of May 7th 1941 when the flames up the tower brought down the floors, the roof and most of the bells. I didn’t realise at the time that this poignant memento of the Liverpool blitz was under threat, because Graeme Shankland’s Liverpool City Plan of 1965 proposed an inner ring-road aligned directly on the nave, and would have left the tower as a forlorn waymark. Shankland’s scheme didn’t happen: the existing bleak dual carriageways behind the Three Graces and eastwards towards the M62 give an idea of how the city would have been carved up if it had gone ahead. In the time that St Luke’s stood abandoned people became attached to it as a reminder of what the city suffered in the Second World War. However, if you leave a ruin as a ruin, sooner or later it falls down. In fact, St Luke’s is a significant building. Built by Liverpool Corporation as a parish church that would also serve for civic services, it was designed by the Senior Surveyors, John Foster Snr and his son and successor, John Foster Jnr, perhaps with the help of a shadowy assistant, “Mr Edwards”, in an elaborate version of what modern architectural historians call the “Commissioners’ Gothic” style. Built on a sloping site which accentuates the height of the 133-foot tower, it has rich architectural detail, with octagonal buttresses rising to elaborate turrets and ogee mouldings over the belfry windows. It opened for services in 1832, and the scale of the nave and aisles made it a useful space for concerts until the completion of the Philharmonic Hall (1849) and St George’s Hall (1854). 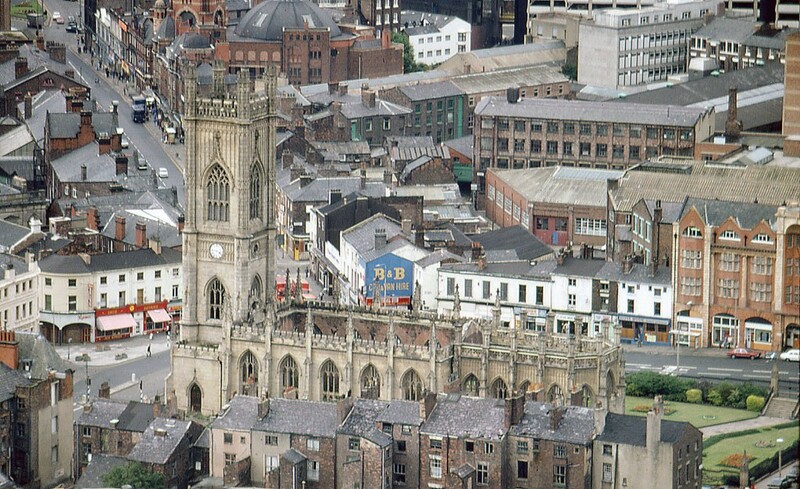 St Luke’s became known as the “Doctors’ Church” because of the large number of medical practitioners and their families from Rodney Street who worshipped there. The stonework has been cleaned to show the fine carving, but nothing of the interior survives. In the roofless tower, the cast-iron bell-frame – believed to be the earliest to be built (1828) – remains in situ, and a clock similar to the lost original was found and installed. The churchyard, which has never been used for burials, was developed as a garden, and now contains Aemonn O’Docherty’s Irish Famine Memorial (1998). The ruins and the grounds of St Luke’s were opened up by the Liverpool arts and events organisation Urban Strawberry Lunch, and are now cared for by the group Bombed Out Church, which runs events, exhibitions and open-air film shows and concerts to keep alive the city’s blitz memorial. This entry was posted in Liverpool's Heritage, Sacred Places on March 20, 2016 by Mike Higginbottom. Hull’s Beverley Road is rich in architectural interest, and includes an unprepossessing but astonishing survival: sandwiched between the former furniture shop of E C Jubb and the former Swan Hotel is the gaunt façade of the former National Picture Theatre, built in 1914 and bombed in an air-raid on the night of March 17th-18th 1941. The film that night was, ironically, Charlie Chaplin’s The Great Dictator. When the sirens sounded the audience of 150 left the auditorium and gathered in the foyer but couldn’t leave the building because of the intensity of the raid. A direct hit destroyed the screen end of the cinema and brought down the roof, but the front of the building survived and no-one was injured. The rubble was subsequently cleared away, leaving the façade and the standing remains of the foyer, staircases and the rear of the balcony. Somehow, the ruins were left untouched from 1941 to the present day. This shell, “as hit”, is now the only surviving civilian bomb-site remaining from the Second World War: http://ncww2mt.freewebspace.com/cgi-bin/i/images/hdm-fb-26.7.05.jpg. Of the other fourteen bomb-sites, twelve are ecclesiastical and one lies within a naval dockyard. When local people, particularly the customers of the Swan Hotel next door, began to appreciate its rarity they formed the National Civilian WW2 Memorial Trust, and persuaded English Heritage to award the ruin Grade II listing. With support from English Heritage, Hull City Council is considering making a Compulsory Purchase Order to retain the National Picture Theatre as an intact memento of the nightmare of enemy action, not only in Hull but across Britain: http://ncww2mt.freewebspace.com/index.html. This entry was posted in Fun Palaces, Humber Heritage on March 14, 2016 by Mike Higginbottom. When I was a student in Hull in the late 1960s, I regularly trundled up and down Beverley Road on the top deck of a bus without taking the slightest notice of the streetscape. Now, fifty years later, I’ve walked the length of Beverley Road from town to the Cottingham Road junction to check what notable buildings survived. 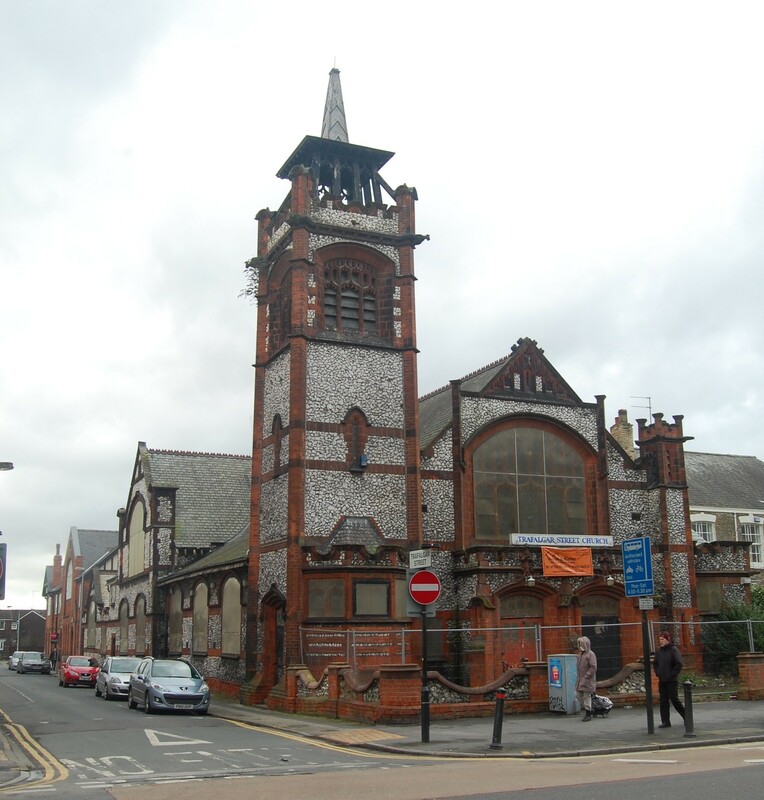 One interesting relic is the Trafalgar Street Church, a curious turn-of-the-century Baptist church with distinctive free Gothic façades of flint with red-brick dressings and a quirky corner tower with an octagonal turret, designed by the London architect George Baines (1852-1934). Opened in 1906, it served its original congregation until 1938 and then became nondenominational. It had closed by 2002 and the adjacent Sunday School has since been converted to flats. The interior of the chapel, though decayed by water ingress, appears to be intact – a light, interesting galleried space with transepts, aisles and a fake hammer-beam roof: http://www.trafalgar-church.co.uk/Photographs. The Friends of Trafalgar Street Church group is campaigning to convert the church to a productive modern use but does not own the building: http://www.trafalgar-church.co.uk. 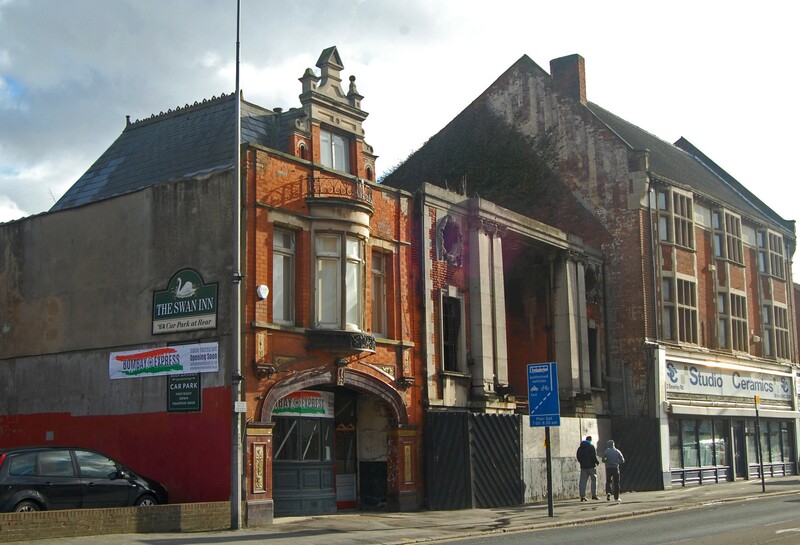 As a Grade II listed building and a landmark within the Beverley Road Conservation Area, a gateway into the city centre, the Trafalgar Street Church deserves a future. This entry was posted in Humber Heritage, Sacred Places on March 8, 2016 by Mike Higginbottom. Sheffield’s self-confessed mapaholic, Mike Spick, does a very fine presentation about mapping Sheffield. It was strongly recommended to me by a friend, and I caught it at a Victorian Society South Yorkshire Group meeting in January 2016. One map in particular that Mike showed alerted me to a piece of Sheffield history I’d never heard of before. A plan of c1890-1895 showed a scheme to link Sheffield’s two competing railways, the Midland and what was then the Manchester, Sheffield & Lincolnshire Railway, at a combined triangular station to be called Sheffield Central. The gradients apparently would have been demanding, because the MS&L (from 1896 renamed the Great Central Railway) runs on a viaduct at the point where the Midland burrows beneath it in a cutting. Clearly the project came to nothing and as far as I know is not mentioned in published histories, but its chronology explains why the Midland Railway brought in their house architect Charles Trubshaw to double the size of their station in 1905, while the Great Central built a new frontage to Sheffield Victoria in 1908. 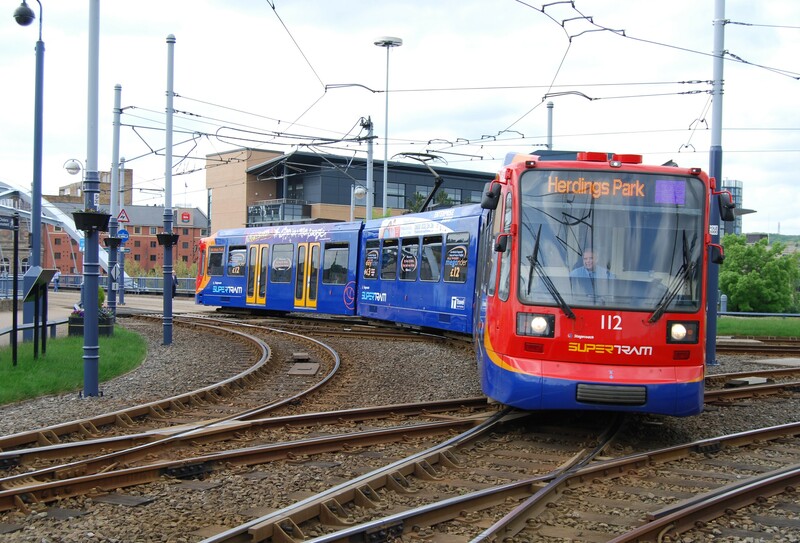 The site of the unbuilt triangular station is now occupied by the delta junction which connects the three lines of Sheffield Supertram at Park Square. This entry was posted in Sheffield's Heritage, Transports of Delight on March 1, 2016 by Mike Higginbottom.